Piano della Citta e Porto dell' Havana. 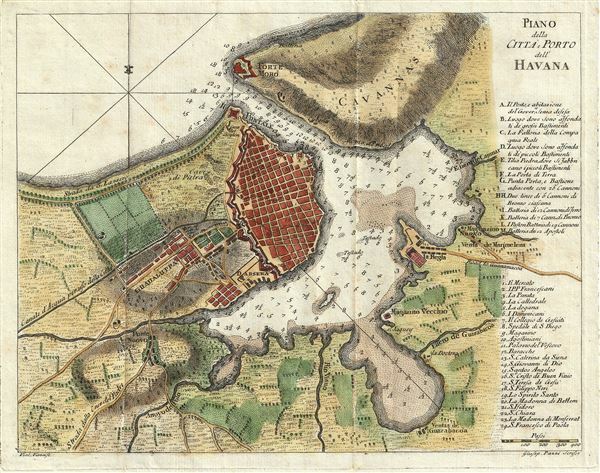 This is an appealing 1763 map of Havana Harbor, Cuba by Marco Coltellini. The map covers the port and city of Havana Cuba from the Havana Bay to Guanabacoa. The map is exceptionally detailed, noting forts, rivers, canals, roads, depth soundings and other topographical features. This map was made in the year following the Battle of Havana fought during the Seven Years' War, when British forces captured the city of Havana, an important Spanish naval base at the time. The map identifies Forte Moro (Castillo de los Tres Reyes del Morro) and Puntale (Castillo de San Salvador de la Punta), the two fortresses defending the entrance channel. The map also lists other important fortifications and barricades along the right border. In 1763, the year this map was made, the Treaty of Paris would restore Havana back to the Spanish. The same year, construction for the fortress of San Carlos de la Cabana or La Cabana, the biggest fortress in Cuba, would begin. This map notes an unnamed and partially constructed building at the very site located just south of the Moro Castle. This map was drafted by Giuseppe Pazzi and engraved by Violanta Vanni and included in vol. 2 of the 1763 edition of Il gazzettiere Americano. Very good. Minor wear along original centerfold and fold lines. Original platemark visible. Blank on verso.